Earn $7.21 in VIP credit (721 points)What's This? The Challenge Paris Roubiax excels on the cobbles and rough roads thanks to its ample 27mm width and top quality construction. A supple 300 TPI carcass and "open tubular" construction means this handmade clincher rides just like a tubular. A dense layer beneath the tread, which Challenge calls PPS, prevents punctures and cuts without slowing you down, while an exclusive rubber compound and chevron textured tread deliver outstanding grip in wet or dry conditions. The Challenge Paris Roubaix Open is available in 700c x 27mm (27-622 ISO). 94-123 recommended PSI. Folding bead. Black/Black or Black/Tan. Claimed weight: 285 grams. Note: This clincher tire is somewhat confusingly labeled as an "Open Tubular." It fits standard clincher rims. Bottom line first you will have a VERY hard time mounting these on your carbon rims without resorting to a tire lever- something I'm not willing to do. I'm good at changing clinchers. I'm reasonably strong, a downright beast upper-body wise compared to many cyclists. I paid good money for my ENVE SES 3.4s and I will not use anything but my hands to swap a tire on one of them. They've worn Schwalbe, Vittoria, Panaracer. Some were more difficult than others, but all doable. Callenge Paris Roubaix? UNPOSSIBLE. Go ahead and try if you must. BUT... I haven't given up just yet. I will try to figure a jig to stretch these babies out in my garage, and maybe later success will come. They sure look nice and seem supple. Meanwhile, my go-to Vittoria are 320 TPI and fairly easy to mount- just sayin'. Before purchasing Roubaixs, I'd read reviews indicating how difficult these tires were to mount! DIFFICULT????? DIFFICULT doesn't even begin to describe it!!! These things are ridiculous and I do mean ridiculous!!!!!! I've dealt with difficult tires before, but absolutely nothing like these!!!! I would strongly suggest to anyone purchasing these tires, to do so with the intent of NEVER doing a group rides with these,,,you need to always ride solo!!! Because if you flat on a group ride and you have to change out tube, you are going to look like a friggin' idiot,,,you're gonna look like someone who has absolutely no idea how to mount a tire!!! So what do think??? Think I like these tires, hahahahahaha!!!! The tire for almost everything. Highly durable with the extra layer between tire and tube. The weight is pretty minimal and the 27 width is perfect for cornering! Fast, plush, good retro look, but a pain. Have had these on my Mercian Vincitore since last Spring. They look fantastic. Had major issues installing them however. As other reviewers have noted, it's ridiculously hard to mount them the first time. They were much easier to remove and remount later, but the latex tubes I'd installed essentially glued themselves to the inside of the tires. Ruined them taking them out. Installed butyl tubes and ran the tires on several tours including Bon Ton Roulet, where I repeatedly hit speeds close to 50 mph on some of the downhill runs. Super handling and confidence inspiring tires! I've also run over glass a few times and there are no cuts. More pain to come though, when I took them off recently to save for next Spring. The butyl tubes seem to have glued themselves into the tires. It's like they're tubulars now. I didn't do anything different than when mounting Michelins, Conti's, Vredesteins, etc. Whenif I remount at home I'll use talcum powder to try and prevent. If it happens on the road, AAA now rescues cyclists too. I put these on my Aileron disc specifics from Velocity. First used them with latex tubes but have since switched to butyl rubber due to a couple of flats and a catastrophic failure (tube exploded the tire off the rim!). I inflate to 110-115 lbs and feel their performance is excellent! Return to butyl didn't seem to affect their performance, but did loads for my psyche. I ride a Renovo John Day model that has no issues with tire clearance so no problems there. They feel extremely smooth and seem to just eat up rough road, small holes, and cobble effortlessly. I've yet to do an extremely technical descent on them but hard cornering as much as I have done is very good. I'm a competent and aggressive descender and feel nothing but confidence in these tires. As for wider being slower I'd say that has not been my experience at all. They perform very well in our club pace line, with no noticeable increase in rolling resistance. I got them on sale earlier this year so an excellent buy IMHO ! i am afraid i have found most of the reviews rather unhelpful, often with too many words describing very little transferrable experience, i was hopping this space was for more than just ranting of inexperienced kiddos. butyl tubes are not more resistant to punctures but need to me installed properly to avoid pinch flats. if you do not use levers these tyres are difficult to put on. if you never used levers, have a look at one of the instructional videos on youtube, those with latex tubes often explain other little tricks such as using talcum powder etc. good graveldirt road or cobbled road specific tyres tend to be difficult to mount on any rim, there is a good reason for it. do your homework and do some research before you spit fire in the reviews here. the overall look and feel suggest they may last longer. most of my training is on gravel, dirt tracks and cobbles so i am always after tough racing tyres with good suppleness and resistance to gravel specific punctures. Amazing ride but runs wide! Quick version Great tires, runs as smoothly as you could hope, has a bit of a with penalty and some spring is missing, but at 80psi you cant have it both ways. Perfect for when you need a bigger tire. Long Version I have an upcoming event that will require wider tires and I have a frame (Bianchi Infinito CV) that can handle up to a 28mm. I read a lot of reviews on various 28s and the idea of a tubular feel in a clincher was quite appealing. 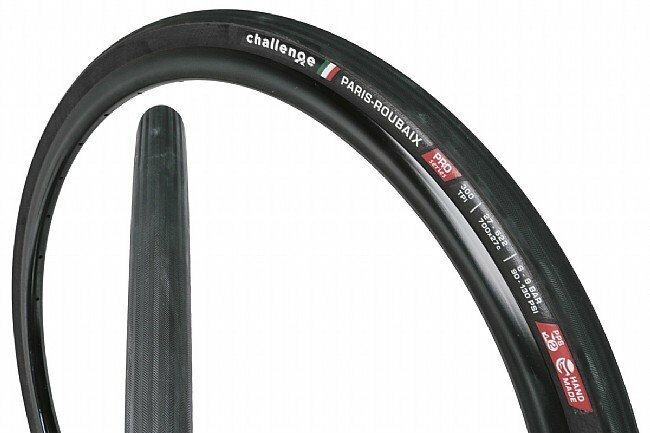 So I decided to order the Paris Roubaixs along with the Challenge Latex tubes. I went with latex as they, combined with the high thread count of the tires, would render the most supple ride (per reviews and what some of my friends had to say). First, my issue list... The first major challenge (no pun intended) was getting the tires mounted. As other reviewers have noted, the open tubulars can run tight and to get them on my Enve 3.4 (not component name dropping here, the wheelset comes into play later in the review) I had to take them to the local shop. (I have since removed them and remounted them with no trouble at home. They stretch over time.) So... Once mounted I kept my fingers crossed to see if they cleared my brakeframe combo. The did, at least fresh back from the shop. To my dismay, after 24 hours, the tires had stretched to the point where the front would not clear the brake arch. I was running all Campagnolo to keep the Italian theme of the frame and was bummed at this to say the least. What to do? New brakes. I ran into this problem with my old road bike as well... Campy brakes have a hard time with wider rim/tire combos (YMMV). For a perspective, the tires on the Enves were running at 31mm! With higher-arched brakes that were built with wider rims in mind, I had 4mm to spare at the top, so good to go! The ride was fantastic, smoothed out road chatter, ruts and semi-potholes that really left a smile on my face. There is a weight penalty over the 23mm Conti 4000s II I was running, and in climbs I didn't feel as agile. Puncture-wise the older TPI count of 260 seemed to flat a lot, but this set with extra protection has gone over 200 miles in wet and nasty debris with no problem. As an everyday tire I think they run a little too wide/slow for me, but they will serve me well in my grave/lroad adventures. For my training/tempo rides, I've ordered the Challenge Criterium 23mm and expect the same feel with a little more responsiveness and a little less cushion. I tried mounting these tires myself and could not do it. Had to take them to a shop and obviously cost me more money. Will post again once I have gone on a couple of rides for the important bit. My Trek Domane came stock with 700 x 25's - 2 flats in the first week of riding. I upgraded to the Challenge Paris Roubaix - and have been bombing nasty New Hampshire paved roads and exploring every dirt road I find. Many of my exploratory routes have degraded into rutted, rocky logging roads without a single flat so far. Now approaching 1000 miles of abuse with not a flat or issue. The ride is plush and fast. Just wanted to note that the tires I received as of January 2014, were the old 260 tpi spec, and not the 300 tpi spec listed. The 260 tpi tires are supposed to ride better but be more puncture prone. Not a big deal to me, but we'll see. As of this review, I have not ridden the tires, but have no expectations that they will ride poorly given the large amount of volume they have. I mounted the tires on custom wheels with wide H Plus Son TB14 rims. The tires measured out to be 29.5 mm wide directly after mounting according to my digi caliper. I use the proper machinist caliper technique, which is just barely touching. No compression of the tire took place during my measurement. The tires were not as hard to mount as I expected. I have read horror stories on the web of people returning the tires without ever being able to mount the tires. But I managed to mount both solely by hand. I have reasonably strong man hands, but am a skinny vegan who wears skinny jeans, so they aren't like superdude strong man hands. I'd say average strength man hands that tire easily, but with a lot of mounting experience. Anyway, if you ever have mounted a Vittoria open tubular tire, it is a similar level of difficultly, but about 10-20% harder. However, the type of rim tape seems to be very critical. If you are using a plastic stretchy type of rim hoop that comes with OEM rims, then you'll probably have a very tough or impossible time. One of my rims has Velocity Velo Plugs, and the other a couple wraps of thin Stan's rim tape. Weird I know, but this is invaluable info for you. The rim with the Velo Plugs was much easier to mount the tire onto than the taped rim. I don't believe that I would have been able to get the tires on if I used anything thicker than the Stan's tape, esp given my average strength man hands. No pun intended, but that's pretty good in retrospect. Thanks for your review, and for the heads up about the incorrect TPI specification! We'll take a look at our stock to check that our description accurately reflects our product. If you have any questions or concerns, don't hesitate to get in touch with our customer service department at [email protected]! I bought a set of these tires a few months ago for my aluminum cyclo-cross bike. I installed these on a very basic aluminum rim with no problems. I ride mostly in an urban setting on paved roads, some cobbles, and ocassionally on improved dirth paths. The most impressive thing about these tires is the excellent ride quality. They absorb a large degree of the road vibrations providing a very comfortable ride. I don't know if this has more to do with the width of the tire or the open tubular construction of the tire but either way it yields a very smooth ride. Regarding rolling resistance my anecdotal feeling is that you give up a little bit but the benefit of the smooth ride far outweighs this penalty. I agree with the other review that these tires are difficult to mount, particularly the first time. Ride quality seems very good. I use them strictly for paved road riding. I don't have enough miles on them to judge their puncture resistance or durability. This is a well made tire that vastly improved my comfort on an aluminum rain bike. Supple but durable is a nice combination. The trouble is the aforementioned rain part of the equation. Theres no way for these tires to shed any significant water with the depth of the tread. I even find the rear will slip on wet asphalt when Im climbing out of the saddle. Long story short, its nice for dry cruising but look elsewhere for the winter months. This is my tire choice for my 2013 Salsa Colossal. It is the widest, comfiest, most bombproof rubber I can run. I'm 225, and run these 6575 psi for rough pavement and gravel, a little higher for smooth pavement. They measure out to be about 29mm on my stock Sun Assault (19mm) rims. They will run wider on wider rims. They can be difficult to mount initially, especially on a narrow rim, but once mounted are stellar. I highly recommend Challenge tires, and especially the Parigi-Roubaix and the Strada Biancha. These are the tires I currently plan to use for the 120 mile Cornhusker State Games gravel race in July. I use these tires on and off road, in and around Los Angeles, CA. Would be 5/5 if they were easier to get on or came with a super powerful mounting device.